If the name Teola Trowbridge has a familiar ring to it, that’s because you may have seen it on the News-Gazette’s 70 over 70 finalist list in March. Nominated as one of the movers and shakers in the Champaign-Urbana community, Teola has definitely been an influential force around DSC. Teola’s history began with DSC when she relocated to Champaign from Wisconsin. At the time, she was Logistics Manager for Kraft Foods, and DSC was doing packaging work for Kraft. During her tenure there, she met Kyla Ray, Dale Morrissey and others from DSC. 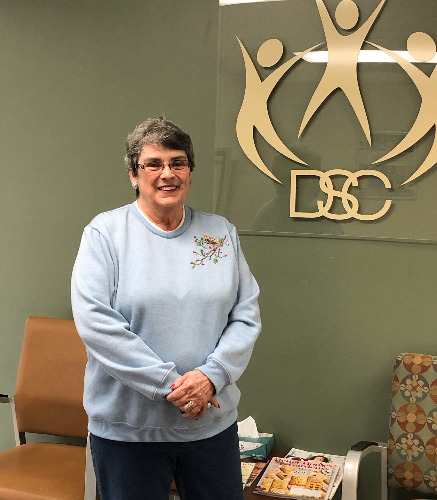 Because of the many relationships that developed over the years between the two organizations, Teola was invited to join the DSC Board of Directors. Teola’s tireless efforts in her volunteer capacity that ultimately created the CCDDB, needed further recognition at that time. So, in 2006 DSC dedicated a newly built group home to Teola for her service. The Trowbridge House was built as a result of the successful campaign, led by DSC, to create the Champaign County Developmental Disabilities Board. Teola was a member of the Steering Committee to create this board and was involved in every aspect of the campaign, from the planning to the execution of that plan. Her knowledge and influence helped educate voters of Champaign County about their choices and shared with them the positive impact this board would have on our community. With Teola’s commitment and tireless efforts, along with many volunteers, the referendum solidly passed 65% to 35% on November 2, 2004, thus positively impacting 700 to 1,000 individuals with developmental disabilities who now receive new or enhanced services. In 2006, the Girl Scouts organization recognized Teola as a Women of Distinction, demonstrating the extraordinary impact that women in leadership roles can offer in business and to their community. Teola grew up in Indiana, where most of her family still resides today. She has a son and three brothers, who tease her about her success in leadership and management. “She grew up with three younger brothers. Franklin is her maiden name, so we say she went through the Franklin Brothers School of Management,” said her brother Earle, who is the Toastmaster of the family. Teola is also an avid mystery reader, enjoys canning jellies and jams, tomato juice for homemade spaghetti, and her famous bread and butter pickles. If you can’t find her here in Illinois, she’s probably sitting in her beach chair in Daytona, Florida. Thank you for the legacy to DSC, Teola!